The IPI-2™ assessment predicts the behaviors and attitudes that are likely to result in on-the-job failure in high-risk law enforcement, corrections, and security occupations. The IPI-2 scales measure both personality characteristics and behavior patterns. The scales can differentiate between individuals who express socially deviant attitudes and those who act on them. Fewer Test Items – With just 202 items, the IPI-2 is over 40% faster to administer than similar assessments. 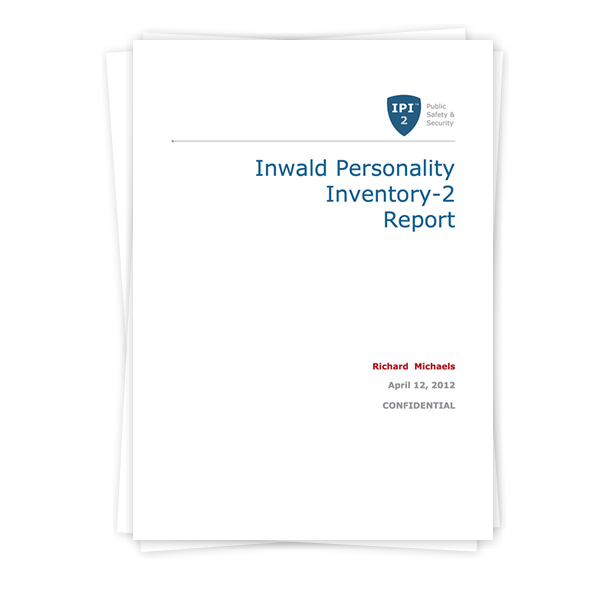 New and Updated Scales – See the IPI-2 sample report for a description of each scale. Contemporary Norm Sample – The new norm sample reflects current public safety job requirements. Personality Profile Graph – Scores are presented numerically and graphically for clear identification of elevated scores in areas which may require further exploration. Field Training Officer Ratings – Job performance predictions that are specific to protective services: 1) Control of Conflict, 2) Public Relations, 3) Report Writing, and 4) Overall FTO Rating. Suitability – The Psychologist Prediction of Suitability provides a rating of “Acceptable” or “Unacceptable” for employment in a public safety or security position. Narrative Interpretation for Every Scale – A scale description and brief interpretation of the individual’s score is provided for all IPI-2 scales. Critical Items for Follow-Up Evaluation – The IPI-2 includes items that have been identified by subject matter experts as being of particular concern for individuals working in public safety jobs. Items endorsed by the test taker are listed in this section of the report. Admission to a large number of these items is cause for concern that the candidate may have difficulty in performing. Using OnSite Pro, PAN’s updated, secure assessment software, the IPI-2 can be administered onscreen and immediately scored, or answer sheets can be scanned into the software for scoring and report generation. The IPI-2 is also available via PAN’s Internet service, NetAssess® International.